MIAMI — Alkalife TEN spring water, America’s premium alkaline water with the highest pH available, is now available for purchase at Earth Fare locations in Florida, Alabama, Georgia, Indiana, Kentucky, North Carolina, Ohio, South Carolina and Tennessee. This latest expansion adds Earth Fare stores to the rapidly growing list of hundreds of retailers across the United States offering Alkalife TEN. Earth Fare has 31 locations spread throughout the eastern United States. 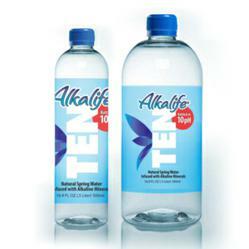 Stores will be offering Alkalife TEN in two sizes — half liter and one liter bottles. “Earth Fare customers represent the perfect fit for our brand of premium alkaline water sourced from one of the purest springs in America” said Jose Fernandez, chief executive officer of Alkalife. With the alkaline diet and lifestyle gaining in popularity, the demand for products such as Alkalife TEN alkaline spring water is growing. Alkalife TEN, sourced from a single spring where the water is filtered naturally through 100 feet of quartzite rock to an underground aquifer, offers customers the highest pH of any bottled water brand. Learn more at www.alkalifeten.com.